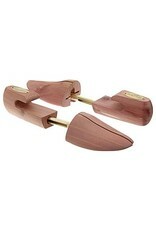 This cedar shoe tree helps maintain the shape of your shoes and thus limit the formation of folds. Using shoe trees can extend the life of your favorite shoes. The real cedar, without varnish or dye, absorbs moisture, helps control odors and gives a pleasant scent to your shoes. If the desired size does not appear in the drop-down menu, it means that we do not currently have it. However, we can easily order it specially for you. Do not hesitate to contact us or to visit us in store.